Sophie Levy | Private Fashion Consultant | DOLCE AND GABANNA FALL WINTER 2013-14 – THE TARTAN PRINT. DOLCE AND GABANNA FALL WINTER 2013-14 – THE TARTAN PRINT. admin 8 avril 2013	Fashion Week, Fashion Week Milan	Aucun commentaire sur DOLCE AND GABANNA FALL WINTER 2013-14 – THE TARTAN PRINT. New cut for DOLCE AND GABANNA, always inspired by their female italian ancestors, this time, they revisited the classic italian dress, by risking to cut the lenght and to make a miniskirt dress. Really nice dress for ceremonies of all types. The dinamization of this dress could be wonderful if we make a look with the EMILIO PUCCI CUISSARDS. We love the research they made for this collection, we see clearly their new vision and the new way to wear a classic but modern dress. This the fabric that is confirmed in the trends internationally, this is a modern way to show the return of the TWEED. This is going to be a fresh return , cause it will be a fresh start from a leather trend that invaded the international runways. So the association of both textures is for us the up and coming future, and this is when the TWEED will make a comeback. 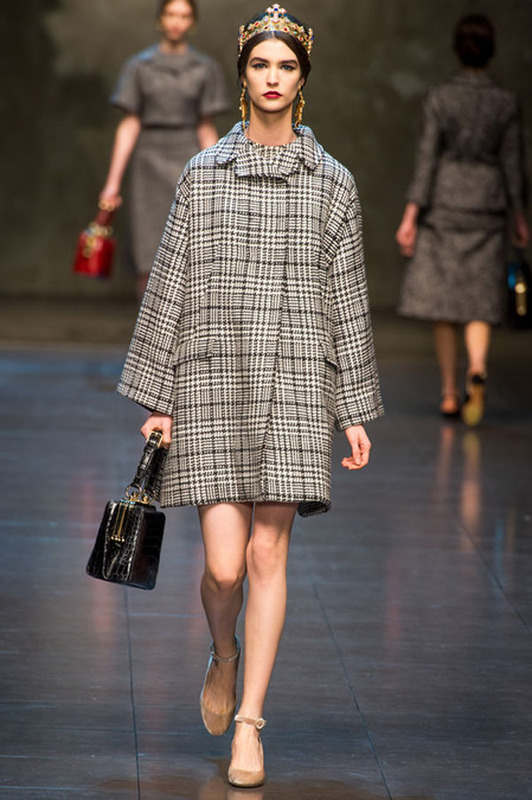 The oversize coat is our fetish item, it can go over our whole entire fall-winter 2013-14 wardrobe. This is a master piece, and also a clue piece. DOLCE AND GABANNA got the spirit of the season, they give us the energy and the trend without being too intellectual, which has been the problem of so many designers that design to please their ego rather than please women. We can’t take it anymore !. We went crazy for this piece, we can imagine this over all the leather pants for the upcoming winter, the modern girl that will wear her perfecto jacket just above this top that is totally classic, but at the same time modern, and it is also the tartan tweed, the killer combination of the upcoming winter .